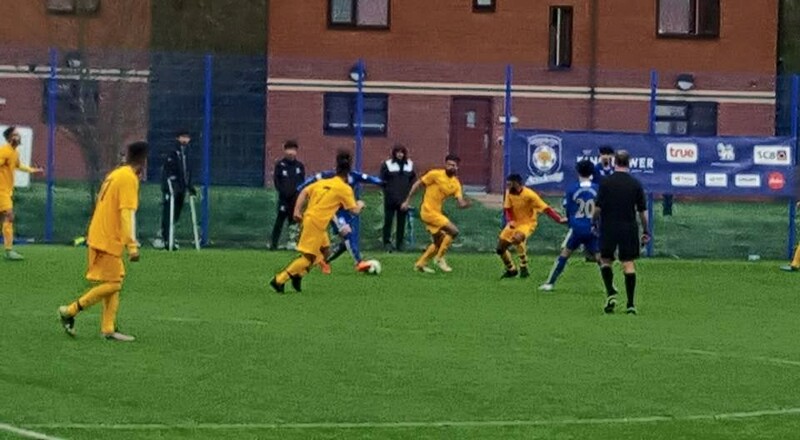 Panjab FA woefully conceded two goals in two minutes despite a well-organised performance, earning an otherwise impressive draw against Leicester City International Academy at the Premier League leaders’ training ground on Saturday lunchtime. Rajpal Virk and substitute Aaron Minhas grabbed the goals to put Panjab two ahead after an hour before LCFC International Academy pegged the visitors back within minutes of Panjab’s second. On a slick, top flight standard surface, Reuben Hazell’s side hounded Leicester well early on to prevent them from settling. The high pressure ultimately forced the hosts’ hands eight minutes in as poor communication between goalkeeper and defender saw both going for a ball 20 yards from goal. Virk, who scored two beauties in Panjab’s most recent victory against Chagos Islands, seized upon a slack clearance to finish from 25 yards into an empty net. Panjab could have, maybe should have, gone further ahead before half-time through captain Amarvir Sandhu and Darlington FC’s Amar Purewal. The former latched on to a ball played down the right flank and seemed clear on goal before his eventual strike was blocked by a recovering defender. Purewal, who had only recently returned from a long-term injury, saw his effort diverted wide after weaving past a player from the right and possibly taking a second too long to pull the trigger. The second half saw Aaron Minhas introduced who spread the ball well in an otherwise scrappy midfield battle. And an hour in the Beaconsfield SYCOB FC player found himself eight yards out to calmly lob the onrushing Leicester keeper for a two-goal cushion. However, what followed was the epitome of being most vulnerable after just scoring. A cross from the right-hand side saw Leicester’s first real attack bundled over the line by the foxes player. And it only took a minute for the international Foxes to score an equaliser. A long ball over the top fell to ’the foxes’s strikers feet who held the play up well before striking into a fairly exposed net. Neither team were able to fashion another clear-cut chance for the remainder of the game but both will take positives from energetic displays.